Reading the notes about Thomas Lowe on the previous page it is clear that he was a deeply committed Christian and who would be able to cope with the vicissitudes that beset the poor in the Victorian era. If you have read the little book, ‘The Memorials of Thomas Lowe’ you therefore may be wondering how the biographical notes by the Rev Strutt could manage to omit all references to his family life. Not long after I had put the Memorials of Thomas Lowe on the website I was able to talk to the great great grandson of Thomas Lowe, Paddy Neill. 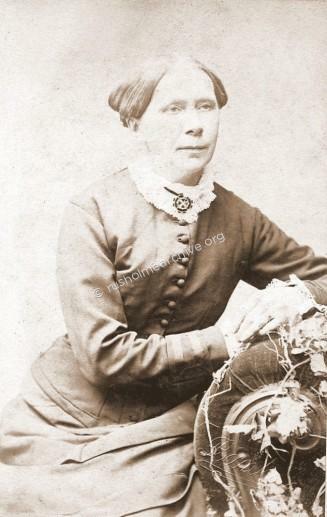 Paddy’s grandfather had married a grand-daughter of Thomas Lowe and Paddy has conducted some research about the circumstances relating to the death of his great, great grandmother Rachel Lowe in 1859 when she was only 40. Paddy also generously loaned me the documents on this page and the photographs of Thomas and Mary. 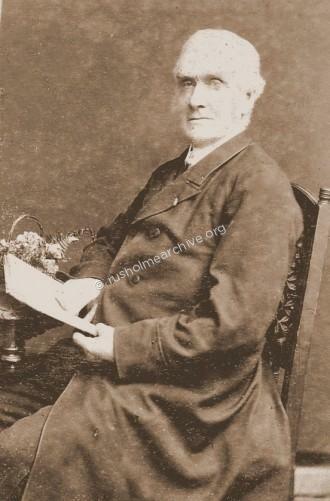 Rachel Lowe had given birth to their fifth child, a boy called John on January 18th 1856. At this time Thomas Lowe was living at Moore Street in Rusholme, but it may have been the case that his wife, Rachel had joined her mother at Birch Cottage following the confinement. 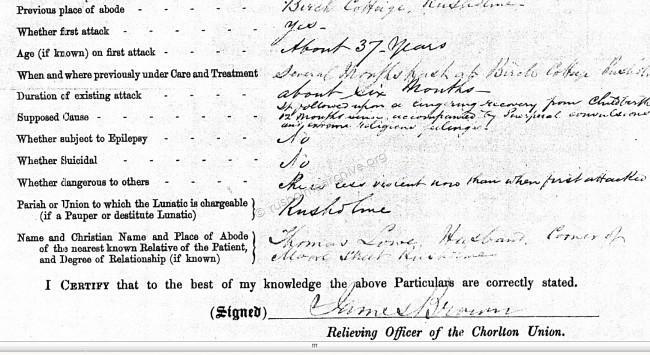 The following notes and extracts are taken from her medical records at the time of her admission to the Prestwich Lunatic Asylum, where she was committed 12 months later on January 24th 1857. Dr Melland was the local doctor in Rusholme. He was consulted about the behaviour of Rachel Lowe and testified that the ‘mania appeared to have been caused by puerperal fever during a period of 12 months following a lingering recovery from child-birth, it had been accompanied by puerperal convulsions and extreme religious feelings’. There was a further question, ‘Was she dangerous to others?’ ‘She is less violent now that when first attacked’. So the sad fact for Thomas Lowe, his children, the sister and mother of Rachel was that she had to be committed to the Lancashire County Asylum at Prestwich, some 7 miles north of their home in Rusholme. Then the treatment of mental illness and the shame and the stigma associated with a member of the family being committed to a lunatic asylum was very real, perhaps this is the reason for the omission in the book about the life of Thomas Lowe. There were no effective treatments for depression and whilst child birth was recognised as the cause of the illness, women were separated from their babies and often sedated. A woman could be like this for years, they would waste away; they had no appetite and would lose a lot of weight. 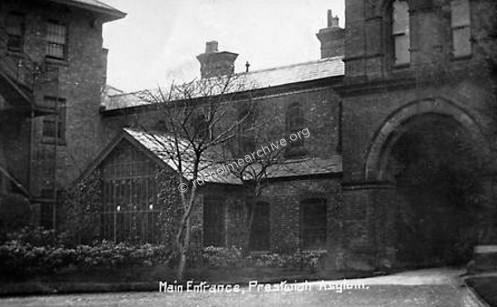 Prestwich County Asylum, (2 photographs below) was built in 1850. It was one of a countrywide network of state asylums that were to house pauper lunatics replacing the unregulated private asylums which had been notable for their appalling treatment of the patients. Perhaps Rachel Lowe was fortunate in being committed to a relatively new institution, her patient number being 860. Now I find myself wondering how she was ever taken to Prestwich? Did her husband Thomas have a pony & trap to take her to the hospital? Were her family ever likely to visit her? Prestwich does not seem so far today, (only 7.4 miles), but it must have been a long journey in 1857. During Rachel’s stay at Prestwich notes were made about her behaviour & conduct. There are a total of 18 entries made by doctors (?) during the period 24th January 1857 and June 26th 1859. Below are some of the notes that are entered on her papers. “She is a dull stupid melancholy woman, rarely speaks & seems occupied with her ideas”. “Very dirty and untidy, dull and weary looking”. “Rather better, has brightened up and been employed today. She is still a very taciturn woman”. “Has an old ulcer on one of her legs”. The entry is then very difficult to read but apparently the leg is swelling and a poultice applied. “A little better, looking rather more lively though still unemployed. She is clean however in habits at present”. “Dull, stupid & weary looking”. “More cheerful, employed in the sewing room”. “Taking cod liver oil but it is not having any good effect”. June 10th a further note about taking cod liver oil at bedtime. June 26th. “Died this day from Pulmonary Consumption”. Thomas Lowe registered Rachael’s death two days later at Prestwich; I can only presume he was notified by post (?) and at present I still have yet to ascertain where Rachel was buried. Since starting this page I have read several papers about Puerperal Insanity and have come to the sad conclusion that the circumstances of Rachel’s death was not uncommon. It has been estimated perhaps 10% of female patients in asylums were admitted with the condition and if recovery from the melancholia was not prompt all too often the patient wasted away and in such a weak state easily succumbed to consumption (TB). If you want to read more about Puerperal Insanity the following link is to a paper written by Professor Hilary Marland of Warwick University, click here or try searching Google as there are other papers that you might find interesting. Seven months after Rachel died Thomas married Mary Cottrell, the younger sister of Rachel. No doubt during the previous two years since Rachel had been committed to the asylum Mary would have been looking after the children. It does not seem unlikely therefore that the marriage between Thomas and Mary would meet a number of practical and family needs. It was however quite unlawful for a man to marry his deceased wife’s sister, the 1835 Marriage Act specifically prohibited such a union. The act was based on Anglican Canon Law and perhaps Thomas, a deeply committed Wesleyan was not impressed with such niceties; (the Anglican Church considered the practice to be incestuous since when you marry, you become of one flesh, so your spouse's sister becomes your own sister as well, this contentious law was finally repealed in 1907). However the marriage was not in Rusholme where they were living but at the Wesleyan Chapel in Oldham Street, Manchester, (see below). This may have ensured that there was nobody in the locality who was aware of their relationship; even so if Thomas was such a well-known active Wesleyan it is surprising that the marriage ceremony went unchallenged. This situation was apparently was not uncommon amongst the poor and Thomas and Mary continued with their life in Rusholme and they had three children between them, George, James and Joseph. 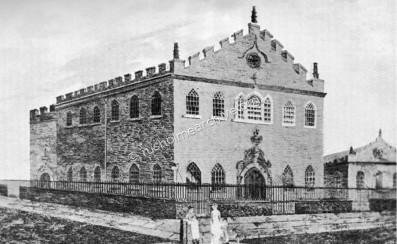 The photograph below is of the Wesleyan Chapel, Oldham Street, Manchester; it was demolished in 1883 to make way for the Methodist Central Hall. The image was sourced from GENUKI, I should like to express my appreciation to GENUKI for use of this image. The photograph below is of Thomas Lowe. The photograph below is of Mary Lowe, nee Cottrell. 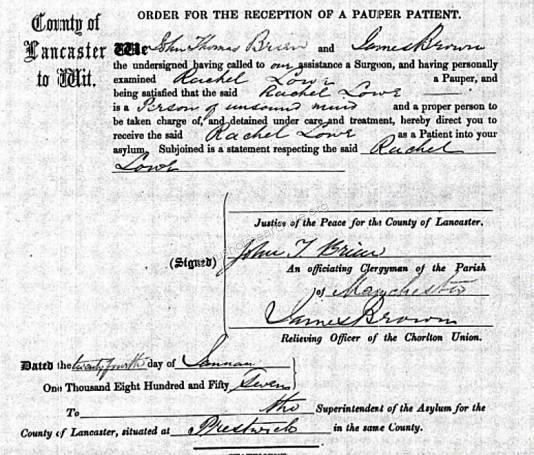 The last son that Rachel had given birth to prior to her committal to Prestwich was called John , he died when he was only 19, the death certificate referring to 3 years of marasmus and immediately prior to his death 2 days of diarrhoea. Marasmus refers to a wasting of the body, more likely to be found today in 3rd world children suffering from malnutrition, but in Victorian time’s diseases such as TB could be the cause of the body wasting away. After Thomas died in 1892 his second wife Mary died 9 years later in 1901 and according to the death certificate, Rachel, the eldest daughter from the first marriage was present at the death. Rachel died in 1915 at Haydock Lodge, a private mental home in Lancashire. What the circumstances were of her being a patient in a mental home is not known, there is however a further curious link between Haydock Lodge and Rusholme that is worth briefly referring to. In reproducing the cover of this book I trust that the publisher & author will not object – I have tried to contact both but I have not received a response – displaying the book cover might even help improve sales! I have reproduced below the synopsis of this book which is printed on the Amazon website where Kindle copies may be purchased for only £2.05. Hard copies may be found by searching ABE book exchange or contacting the publisher; Ampersand Books, The Stables, White House, Leighton, Welshpool, SY21 8HH. “In 1845, the treatment of pauper lunatics at a private asylum in Haydock, Lancashire, caused a national scandal which revealed the worst excesses of the insanity trade, where mentally ill patients were treated as little more than a commodity through which other men could make their fortune. This novel tells the story of the Haydock Lodge scandal, and of Charles Mott, the extraordinary man who was largely to blame for it. Its vivid scenes show the harsh reality of life in the forgotten corners of 19th Century England, and the unprincipled scrabbling after profit which used people's lives and misfortunes as raw material. Charles Mott was the image of the self-made man, who trimmed his conscience to gain wealth and influence. His excesses nearly brought down the Government of the day when the shocking practices at Haydock Lodge were eventually exposed. Although the book is a novel it is based on very real facts, Charles Mott meriting an entry in the National Dictionary of Biography because of his ill treatment of pauper lunatics and scandalous behaviour at Haydock Park in Lancashire. There is very comprehensive paper about Haydock Park and the conduct of Charles Mott written by Andrew Roberts, a lecturer at Middlesex University; it can be read by clicking here for the website. 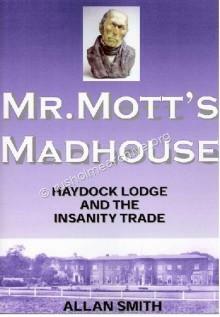 My interest in referring to Charles Mott is that after he was dismissed as the Superintendent of the Haydock Park Lunatic Asylum he eventually settled at No. 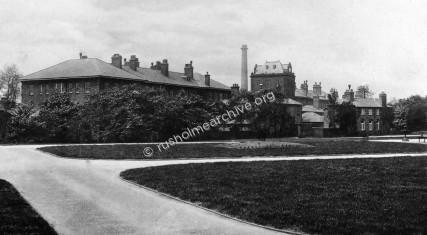 3 Moon Grove, Rusholme, dying there in May 1851.